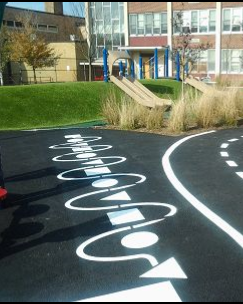 Our RE-USABLE Coroplast Playground Markings are so versatile that playing games at recess is just one of their functions. Need a brain-break? A physical literacy break or do you just need to pump some fresh air into your students and regenerate some brain cells? 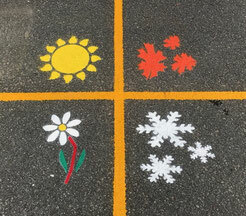 Take it outside and use the Playground Markings. Active Curriculum - Research tells us that if we are active, we fire up the neurons in our brain and create the perfect environment for absorbing new information. Take the lesson outside and fire up kids creativity and imagination! Conflict in the classroom? Take it outside. No, really, take the whole class or just the people who are having difficulties outside and use the Conflict Circle. Not only will this tool assist in teaching the students practical and non-violent ways to solve problems, but getting outside for some fresh air and perhaps a change of scenery will help to expedite a solution. 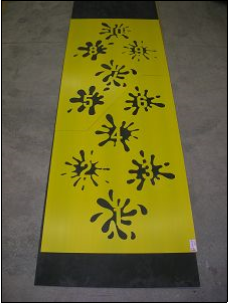 Playground stencils are cut individually, once orders for playground stencils are confirmed they can not be refunded. 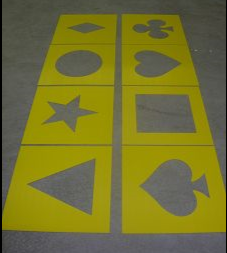 If you do not see the playground stencil you are looking for email us, we would be happy to work with you to find the right stencils for your playground! This game helps children to make better choices when faced with a conflict. Allow the children to use this as a peer mediation tool during recess or if the class has come across a difficult situation, take them out to use this tool to solve the problem. Showing them the different options on how to resolve conflict is invaluable! This game helps children to make better choices when faced with a conflict. 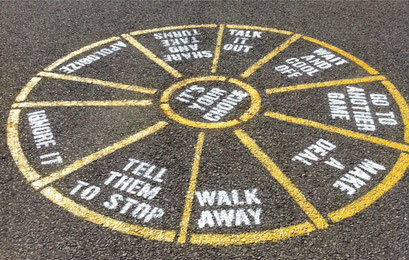 Allow the children to use this as a peer mediation tool during recess or if the class has come across a difficult situation, take them outside to use this tool to solve the problem. Showing them the different options on how to resolve conflict is invaluable! This picture version is ideal for kindergarten, early years and special needs. non-healthy activities move back spaces. Just like snakes & ladders only this demonstrates examples of good activities. ADDED BONUS! We have a list of actions - one for every square. Whenever someone lands on a square everyone does that action! This is an Active Curriculum game. This game is an easy playground game that allows children of all ages to practice as well as better their mathematical skills. Are you thinking Active Curriculum? We have the games and ideas for teachers to use. 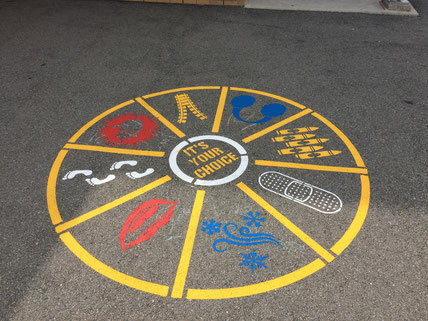 This playground marking can be used for any game where students need to stand in a circle. 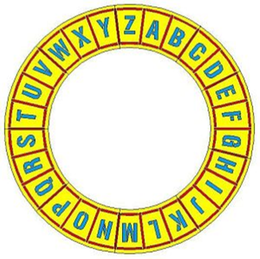 It is a great starting place for outdoor activities, and the letters make this a playground marking that can be used to practice spelling, vocabulary and more. 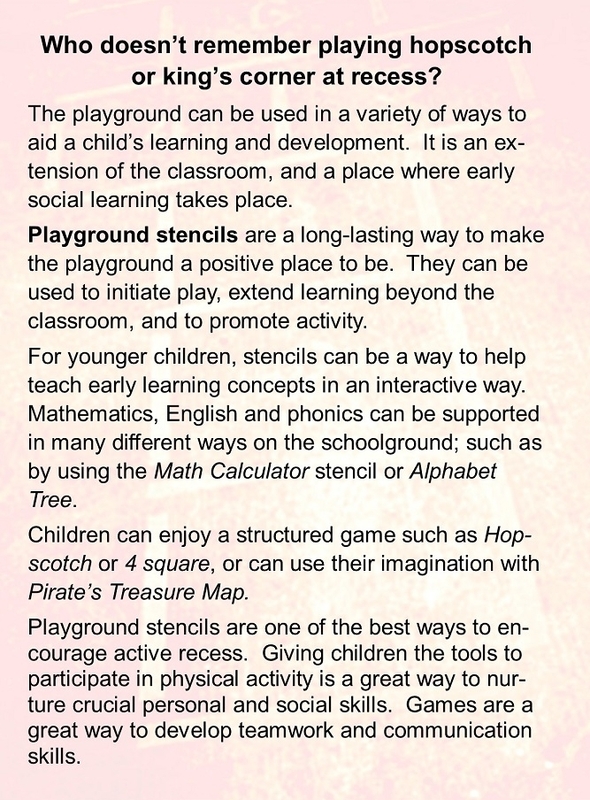 This is a great playground marking for Active Curriculum. Children take turns standing in the center of the clock and use their arms to show the time that is told to them. 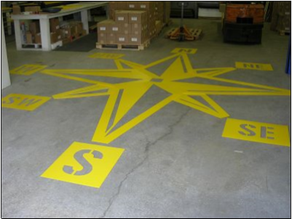 You can use a map or a compass to orientate this playground marking when painting your compass rose. If you are interested let the stars point you north; the Big Dipper, and the North Star can be used to orientate your compass rose. 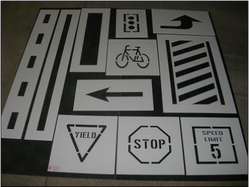 Excellent for a variety of directional games. 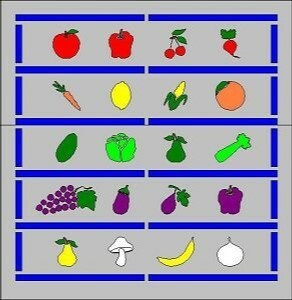 What better way to talk about fruits and veggies by actually being active with them. We have created a couple of really good games for you to play with this playground marking or it could be used for Active Curriculum. 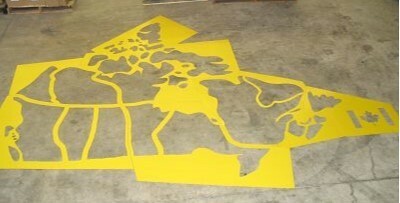 fundamental map skills and promote awareness of geography. This is another Active Curriculum game. Fun variation of Simon Says and memory games. The goal of the game is to mirror the person across from you by repeating the pattern steps they take on the various coloured circles. This traditional game never goes out of style for recess. 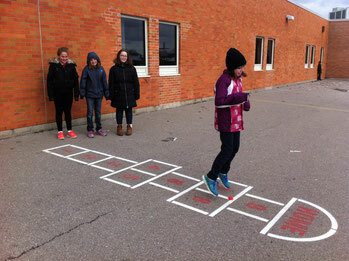 Hopscotch is a game about throwing, hopping and not falling over! Perfect for the novice just learning the game and there are so many ways to challenge the experienced so they are never board. 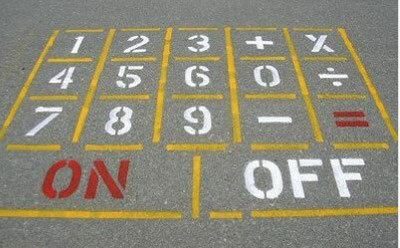 This hopscotch is a bit of a twist with letters instead of numbers. Children can learn how to jump on one foot, gain their balance and recognize the order of the alphabet all while having fun. 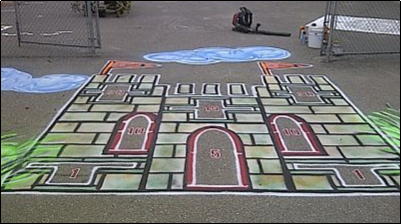 This game is a variation of the traditional hopscotch where children can pretend they are splashing in a puddle. 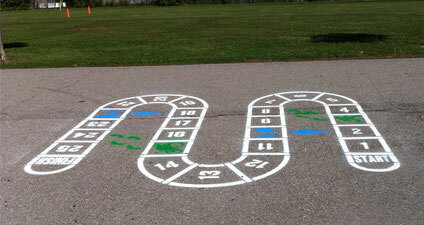 More than a hopscotch, excellent for numeracy games and agility. 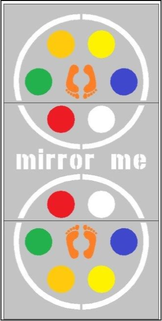 It is an excellent beginner game for young childern as it allows them to learn how to jump on one foot, gain their balance and recognize the order of elementary numbers. This is a ball game where the object of the game is advance to a higher level. Skill, strategy and sometimes just plain luck will help a player advance and stay in King's Court or square number 1. Have you tried doubles Four Square? This BIG playground marking is perfect for this game version. 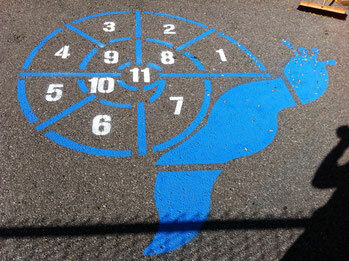 This is the perfect playground marking for teaching fundamental movement skills and playing TGfU games. 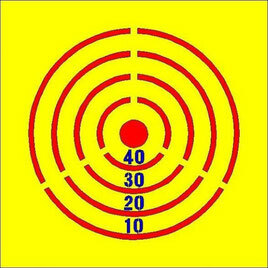 Score points by tossing your makers onto the target. Don't want to make it competitive, only want to teach and have fun with the skills? Don't keep track. A ball is used to bounce off the ground onto the wall target. Imagine taking your class out and allowing them to throw snowballs during a DPA session? It is supervised and they are learning Net/Wall games which is all part of TGfU. Plus the fact that they are throwing snowballs at school! This is a teachable moment where children are taught the rules and understand how and when to follow them. 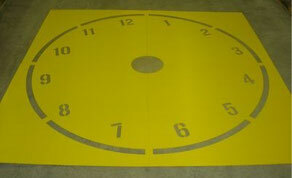 This over-sized target can be used to assist children in using their basic motor skills and throwing accuracy. The Mini Sticks Hockey Rink is an excellent playing space for all your students that are hockey enthusiasts. 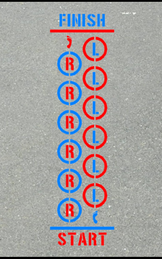 This playground marking can also be used boundary lines during tag or other recess games. 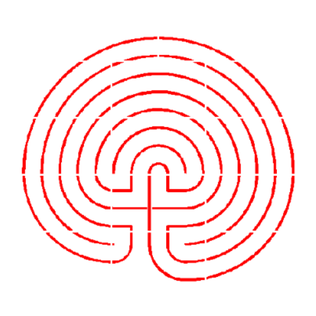 The playground labyrinth circle has a single path leading to the center. What if you were to add your own obstacles on the labyrinth and make it more challenging. 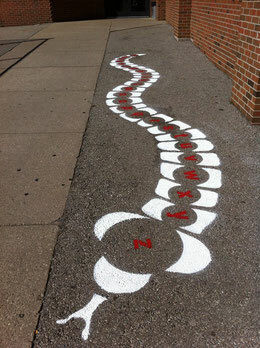 You could leave notes under ground markers for the participants to do various actions or have them move in various ways. Great fun!. Make sure you change it up to keep them on their toes. Run, hop or jump between the rungs of the ladder. Make this part of a permanent workout on the tarmac. Children must be able to hop from left to right with their right foot landing on the left side and their left foot landing on the right side of the game. 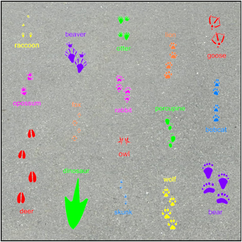 The Fox and Geese playground marking can be used for the tag game Fox and Geese. In this game the fox tries to tag the geese before they can get to the hen house in the center. 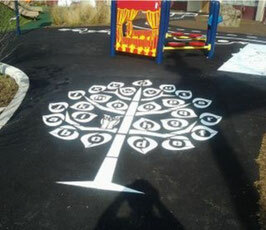 The shape of this playground marking makes it the perfect addition to your yard for circle games! 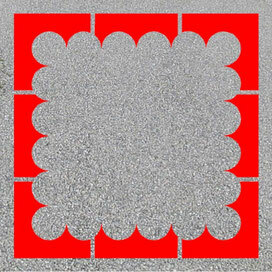 Children learn basic shapes while following a swirl pattern. 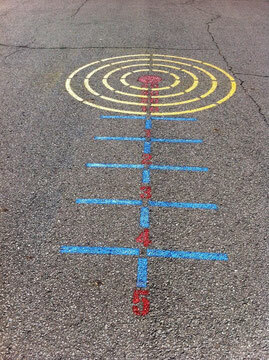 Practice a variety of fundamental movement skills with this playground marking! Throw a bean bag and try to hit one of the shapes, hop on one foot to pick it. 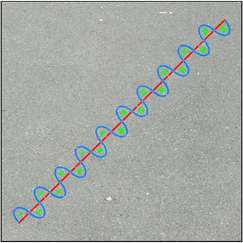 This game is a variation of the traditional hopscotch in which children must follow a swirl. 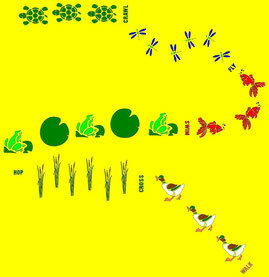 This is a game of imagination and activity, at each stage of the game the children can pretend to be the animal performing the actions laid out in the pond. This bike park can be placed anywhere on your playground. It includes lane marking arrows, signs ect. use to familiarize children with traffic rules. 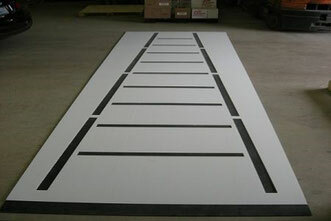 Shapes are placed in a safe area for classes to up behind during a fire drill or actually fire. A place for children to show their artistic skills drawing with chalk. Let their inner artist shine out.